Vinyl banners are some of the greatest tools available in getting yourself noticed at trade shows or other events where you have to visually rise above your surrounding competition. Because your competition will likely be using visual flourishes to attract attention, using numerous vinyl banners around your own display area helps bring a reminder of how powerful printed graphics can be. To complement how stunning those graphics look, you’ll have various configurations available that can help create different strategies in where you place those banners. The reason why banners used vinyl is because it’s a very durable material and can hold up under many different conditions. Even if vinyl banners are used outside, they’ll be protected from the elements, including having UV protection to prevent fading from sunlight. It’s also a material that can be easily customizable, including being available in hemming, grommet, and pole-pocket options. Even more so, vinyl is a surface that makes graphics look stunning. When printed professionally, a colorful graphics display pops out on vinyl almost like 3D. Through this lifelike quality, you’re in a better position to attract attention from across a large trade show venue. Because the vinyl is the perfect canvas for showcasing who you are in images and text, vinyl banners are excellent for any type of promotion. You can add your logo, or use them for general branding purposes. Because fonts show up just as vividly as images do, you can also place special messages on them that you want to convey in the venue before visitors even approach your display booth. 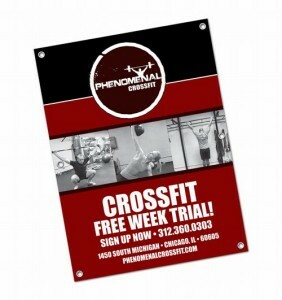 Thanks to different sizes and other variations on vinyl banners, you can use them in different areas nearby or around your immediate location. They all come in numerously different sizes and can reach higher than the average tall person to sizes only a few feet high. Many of them are available in retractable form where they slide out and in to metal stands. These work similar to the old retractable screens you saw years ago when families used slide projectors to view family pictures. You’ll be happy to know that the banner stands are very lightweight and easily portable when you’re traveling across the country for trade shows. While you usually see vinyl banners used at trade shows, they can be used virtually anywhere where you want to promote something important. They can be used in political campaigns when trying to capture the eye of the public about an important issue. For those holding community rallies, vinyl banners can help convey messages through compelling imagery or using stylized fonts. Even fundraising events can gain many benefits using vinyl banners by using vivid graphics that bring true impact to those just passing by. You’re going to need a place that gives you those high-quality prints in order to stand out. Let Electro Image LLC be that place. With headquarters in St. Louis, Missouri, we serve companies across the nation in providing state-of-the-art printing services for every purpose. You won’t regret using our vinyl banners and how well the message you’re trying to communicate will come to vivid life for casual observers.